VietNamNet Bridge – For Huynh Thi Thuy Dung, a primary teacher in a remote area of Dak Nong Province, all she wishes for the new year is a kitchen. The kitchen, to be built next to the classrooms, will be the place where Dung can cook meals for her students, so they will no longer get hungry during class. Dung has been working as a teacher at Vo Thi Sau Primary School in Krong No District’s Dac Nang Commune for eight years. Since her first days at the school, she has witnessed the difficulties faced by students when they try to go to school. “Most of the students are from ethnic minorities, including Dao, San Diu and Tay, and live in poverty. Their parents are always busy working on the fields, leaving them at home taking care of each other,” she told Thanh Niên (Young People) newspaper. Like other remote areas, going to school is a challenge for children. They have to walk a long way and, on rainy days, the path can be very slippery. To help students shorten the distance, local people have built a shack near the school for them to live in. About 20 children, aged between six and nine years old, spend six days of the week in the shack, preparing meals themselves with the rice supplied by their parents. The meals always lack nutrients. Sometimes the meals include wild vegetables and dried fish, but most of the time the children eat rice with salt. Thus, many go to school still hungry, Dung said. Dung understands that her task is not only teaching, but encouraging students to keep coming to school. Children can’t focus on studying with an empty stomach. Dung decided to do something to fix it. In 2017, she started going around asking for donations to improve the quality of meals for more than 160 students at the school. Children have been provided with three lunches per week. The total cost of each meal for the group is VND900,000 (US$39). The meals are cooked by a local household and the money is donated by parents, local residents and other donors. “The sum of money is quite a lot for people here. I wish I could give the students six meals per week, so they are not hungry going to class,” she said. 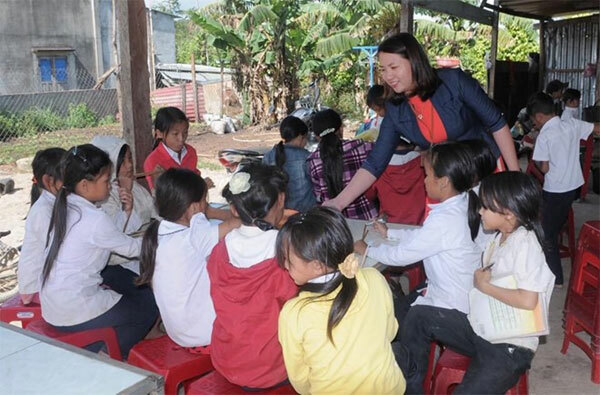 Doan Thi Hong, principal of Vo Thi Sau Primary School, said she has seen a big change since the donation of lunches for the students carried out two years ago. “Previously, the children studied in the morning and came home for lunch. After that, most did not return to school in the afternoon,” she said. Hong said the school has managed to build a library for students to encourage them to read and spend more time at school. The cost of the library was nearly VND15 million ($645), which was mobilised from parents and donors. Asked about her wish for the new year, Dung said she hoped she could raise enough money to build a kitchen at the school, so she could cook lunch for the students instead of asking for help from local people. “I hope that my students could have a place to eat lunch and a place to take a nap between studying time,” she said. Dung said she believed that when everybody gives a helping hand, students can strive to continue their studies.